1. Fireflies emerge in the park as twilight fills the sky. 2. Peas from the garden eaten straight from the pod while standing in the kitchen. 3. We clean out the freezer and toss some things that were indistinguishable from the freezer burn coating them. (Note: plastic grocery bags are not adequate for long-term freezer storage.) There is now room for popsicles and homemade ice cream and ice cubes (radical, I know! ), and I can see how many baggies of strawberries I have left from last season for daiquiri-making. I meant to post this last week, on the actual anniversary, but I lost track of the days and only this morning recalled that I had missed the date. Also, apologies for the quality of the pictures. I found them rather late in the game and, rather than dig out the scanner, I opted to photograph them, and the quality suffered. 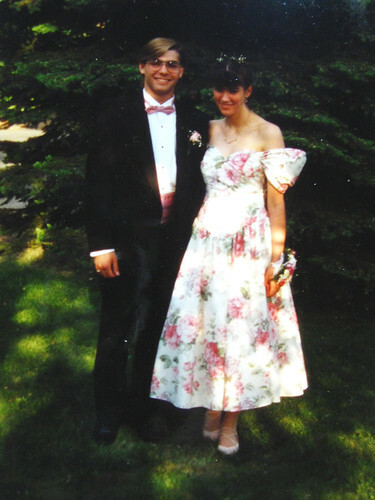 Twenty years ago this month, Grey Kitten and I attended my senior prom. Finding the right dress took far longer than finding the right date. I know a number of girls who waited to find escorts until after they found their outfit. 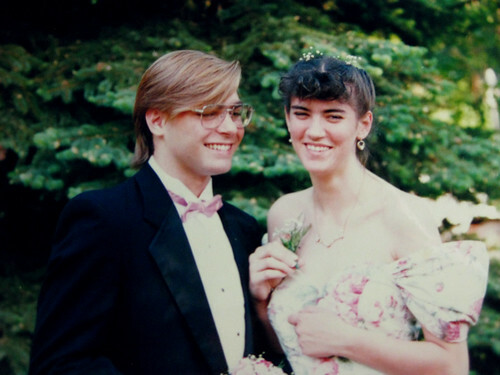 I was about to type that I didn’t care that much about fashion, but my mother reads this blog and she would tell you that searching for a prom dress with me was a miserable experience for both of us — and I only took her on a third of the excursions! Ultimately, the dress was found, but not in my size. The shop made some adjustments, but not enough, and Mum and Gramma had to pull it apart and put it back together again. Twenty years later, I cannot begin to fathom how much work that must have been. Thank you, Mum. I remember walking around the grounds when we got there. I remember getting our official portrait taken, with the awkward hand placement that accompanies such shots. 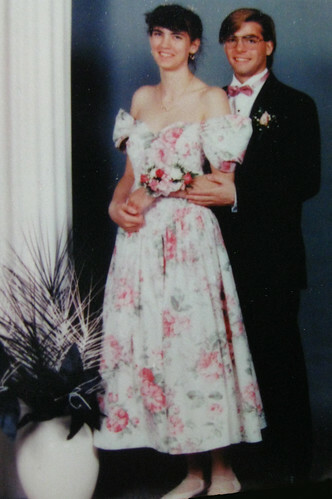 There must have been some pre-dinner mingling, because I have pictures of my friends in their dresses. Our table was served dinner on the early side of the room, and neither Grey Kitten nor I were big eaters at that time, so when the music started, I assume to create ambiance during the meal, we looked at each other, got up, and hit the dance floor — the first and, for a long time, the only couple out there. And while I do recall sitting down at least once, I think we spent most of the evening dancing. Eat breakfast outside more often. I tend to get a slow start on weekends, so it seems like a natural antidote to that would be to pack my thermos of tea and a breakfasty food item up to the park. Once I’ve left the house, it’s much easier to stay out, even if I do have to stop home once in a while. Prepare more salads. This will require finding a reliable protein source for Rudi — chickpeas might be an option. They appear in my favorite pre-made lunch salad. Ride 25 miles on the bike with minimal stoppage. I can bike home from the ballpark without having to stop and rest my legs, but that’s just about five miles. As I really only like to bike to destinations (work, a ball game, a snack), I should pick someplace 25 miles away to go see. Of course, then I’d have to get home from someplace 25 miles away… Does that mean I’ll need to be able to bike 50 miles in a day? Getting to this goal may require some more thought. Engage in icy treats. I have failed in my plans to make popsicles the past two weekends, but that’s clearly because I was waiting to be able to add them to this list. I also was given an ice cream maker this winter, so I’d like to make some homemade ice cream. I have already worked some daiquiri-making magic, but can you ever have too many strawberry daiquiris in a summer? Get to the beach at least once a month. Finish my Ravelympics and Tour de France knitting projects on time, whatever they may be. Hone my bubble-blowing skills. I used to be able to blow bubbles inside bubbles with some ease. I am out of practice, but did pull it off a couple times Saturday night. After all, who doesn’t need to add that kind of skill to her resume? Bring laughter to strangers (and friends). What’s on your summer goals list? I look forward to reading about them, be they vague or specific, selfish or selfless, personal or public. summer season begins in … uh, now! Memorial Day weekend kicks off the beginning of the summer season, and the weather is clearly well-aware with high temperatures expected to be in the 90s. Finish the Mosaica socks. The last round of Sock Madness starts in the morning. I bought more white yarn, as it was clear I was going to run out in the home stretch. Have a picnic with John and Nicole, who arrived home from Albany too late tonight for our planned excursion to the Yards. Pick more strawberries and peas at the garden. Go swimming. The pools open for the year tomorrow. Make popsicles. I didn’t get around to my planned trial last weekend. Attend a barbecue. Megan has proposed one on Monday, and I hope to cross the Potomac in pursuit of fake meat cooked over a contained fire. Go to a movie. There are several to choose from. Do a few chores: laundry, change the sheets, put away the winter clothes (the summer ones got taken care of last weekend). Drink strawberry daiquiris. Because isn’t that what summer is all about? What are you hoping to do this weekend? 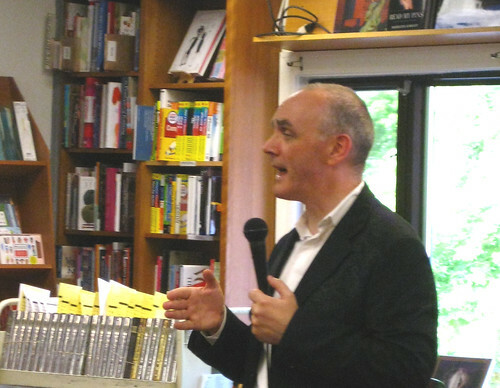 Category: books,life -- uncategorized. There is/are Comments Off on summer season begins in … uh, now!. 1. A young girl and her mother out for a stroll are sitting on a wall, taking a break. The girl has clearly brought her stuffed dog out to stretch his legs too, since he’s on his leash — a navy blue tie. 2. A storm is coming. You can feel the electricity in the air. It’s almost as invigorating as being at the ocean. 3. Knowing that it’s supposed to cloud over sometime in the afternoon, I head to the park early (for me), taking my thermos of tea and (late) breakfast with me. I get several hours sitting at a picnic table reading before I’ve usually left the Burrow. And, while strictly this isn’t beautiful, because it made me cry, its beauty lies in its perfection. A line from Sherlock: “I was so alone, and I owe you so much.” Friendship summarized in agonizing clarity. Category: three beautiful things. There is/are Comments Off on leash, electricity, and outside (and one line). Just last night, Karen and I were talking about how confusing it is when two different things go by the same name. We started the conversation with the chigger, which refers both to a mite (which takes a bite out of you) and to a flea (which burrows in you), and moved on to daddy long legs, which can be an arachnid (what I grew up with), a spider, or a fly. And today I found a third, although this one is admittedly closer than the previous two examples. That would be a Magnolia Soulangiana. Living in the south, you come to know this is a magnolia, because it rivals the cherry for earliest flowering tree in the spring. 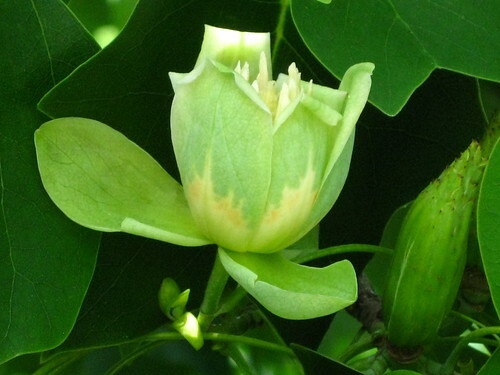 It’s also called the yellow poplar, but it’s not actually a poplar. 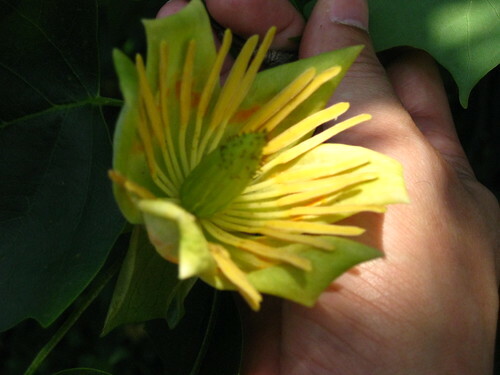 Instead it’s a Liriodendron tulipifera. 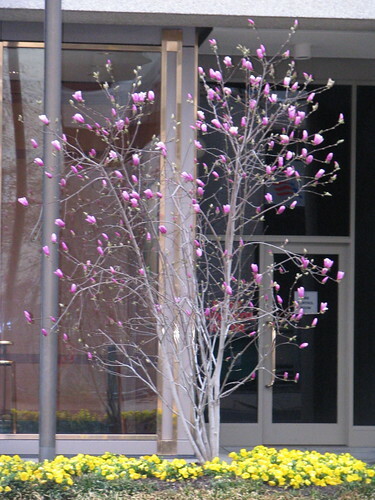 It’s in the Magnolia family, but not in the Magnolioideae genus (where all the magnolias are classified). 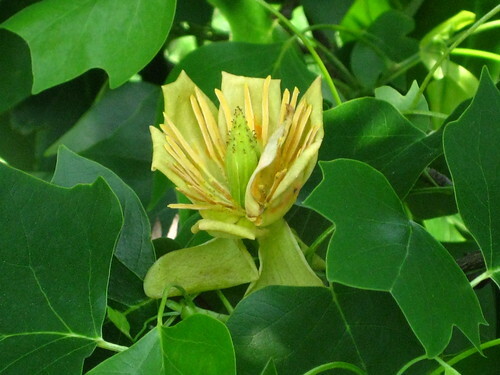 Instead it’s in the Liriodendron genus. These particular trees are growing in Rock Creek Park near Woodley Park.